Several million people will visit Zion National Park this year, and almost all of them will visit during hot, sunny weather under clear, blue skies. And that’s great — but it’s not Zion’s best time. In the brief winter months, Zion becomes moody, with clouds and snow and rain, as well as some sunny, but chilly, days. Most people stay home during this time of year, but that’s exactly why you shouldn’t. Zion National Park is located in southwest Utah, about an hour east of St. George. From Interstate 15, take exit 16 (or exit 27, if you are approaching from the north). Follow Utah Route 9 into the park. Route 9 runs through the park and continues east, allowing access from Kanab, Utah, and US 89. As 2016 wrapped up, I desperately needed a break from work. And, as a resident of Florida, I really wanted to see some snow. So, I decided to go to my favorite national park for an easy, but cold, vacation. I booked six nights in a hotel in Springdale (for about $75 a night — a room that goes for quadruple that in the summer). I decided I’d venture into the park and hike whenever and wherever the weather allowed. I ended up with the perfect balance of snowstorm days, transition days, and sunny days. I hiked most of the popular canyon trails (some of them twice), and took some nice pictures. 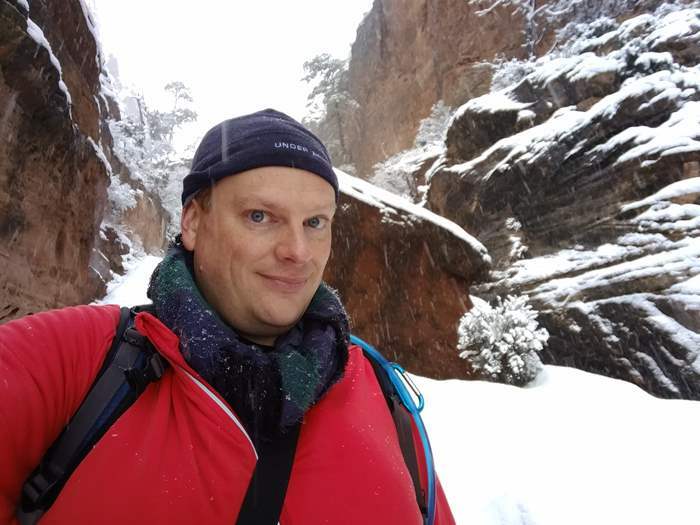 I also learned a lot about visiting Zion in winter. Let’s start with the weather. Watch this clip all the way through, and you’ll see some blue sky, clouds, and a walloping of snow/sleet/rain — all in the course of a winter day in Zion Canyon. Those kinds of days are great for photography, with plenty of interesting clouds and patterns in the light. But, they do require some preparation. I fared pretty well with three layers on the top (thermal shirt, hoodie, and jacket) and two on the bottom (thermal underwear and jeans). Wool socks, a cap, and a scarf were also essential. The scarf was a gift given to me just before the trip. I didn’t think I’d need it, but it was very helpful! Gloves were only useful when holding the chains while climbing Angels Landing. Sunny days might be colder than you’d expect. Without clouds, the heat escapes at night. I started the day with single-digit temperatures on those days. The cloudy days had a consistent temperature that hovered around freezing, day and night. The higher I climbed, the more likely it was that I’d see snow instead of rain. If you’re really anxious to see snow, and it’s too warm in the canyon, you could drive up to the Kolob Canyons area or the Cedar City/Brian Head area off Interstate 15 to the north. If there’s snow everywhere, what can you realistically expect to do in Zion? If the snow is fresh, you might want to stick to the easiest trails – or make your own. I spent one delightful morning walking along the Virgin River near the Court of the Patriarchs, making the first set of tracks in the freshly fallen snow. 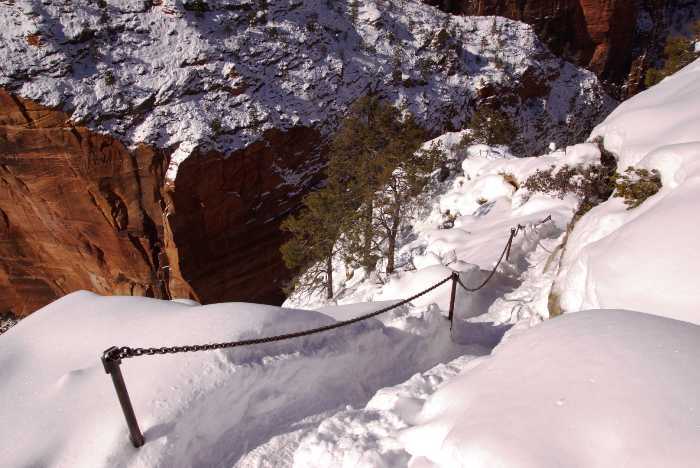 While there aren’t many visitors to Zion in winter, there are enough other hikers that you’ll probably find your favorite trail has been trampled enough to be passable. Bring a hiking stick with a tip suitable for snow, and get some slip-on chains for the bottom of your boots. … but I made it all the way to the top on the second try. And as you can see, I wasn’t the first one there! A day later, I tried to reach Observation Point, and made it most of the way there, but the end of the trail was too snowy to hike without snowshoes. That’s the thing about hiking in winter. Instead of being disappointed that I didn’t make it to the destination, I was thrilled to have made it as far as I did, and to have enjoyed the hike along the way. Oh, and beware of icicles. Sometimes they’re monster-sized and hanging directly over the trail. As you hike, in otherwise quiet places, you’ll occasionally hear the crash of snow and ice falling from the cliffs. It’s not a reason not to go — just a reason to be careful. 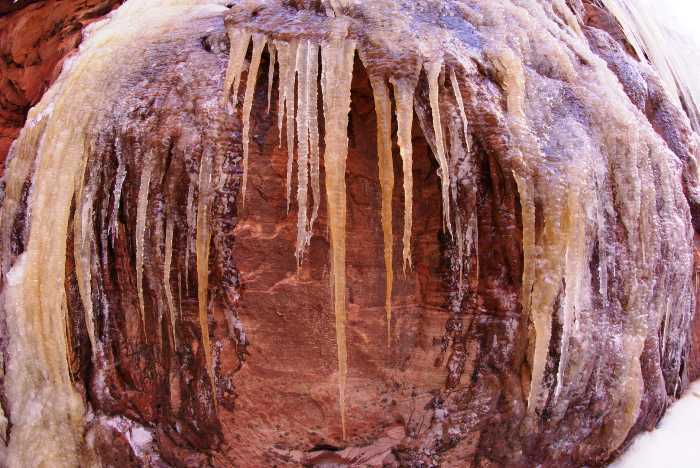 Winter can mean slippery roads in Zion National Park. That’s bad for anyone who is inexperienced in snowy conditions, but good news for anyone who likes the challenge. During my visit, I experienced slightly dangerous roads on Zion’s east side — this part of the park is higher in elevation than the canyon, which means you’re more likely to find a winter wonderland up there. Of course, the roads could get slippery anywhere in the area if a winter storm moves through. Rent a 4-wheel drive vehicle if you can, or pick up a set of chains at an auto parts store if you think you’re headed into a bad situation. Oh, and this might be the very best part of visiting Zion National Park in winter: no shuttle buses. For most of the year, Zion is so heavily visited that it’s necessary to close the canyon to private vehicles. During this time, everyone must use the shuttle buses, which depart from the visitor center. But, from late November through early March, you can drive all the way up to the Temple of Sinawava in your own car. It’s more convenient, and you can stop anywhere you want along the road, assuming there’s a legal parking spot. If I haven’t sold you yet on a visit to Zion in winter, keep reading. This trip shows you dozens of great ways to enjoy Zion in the cold. 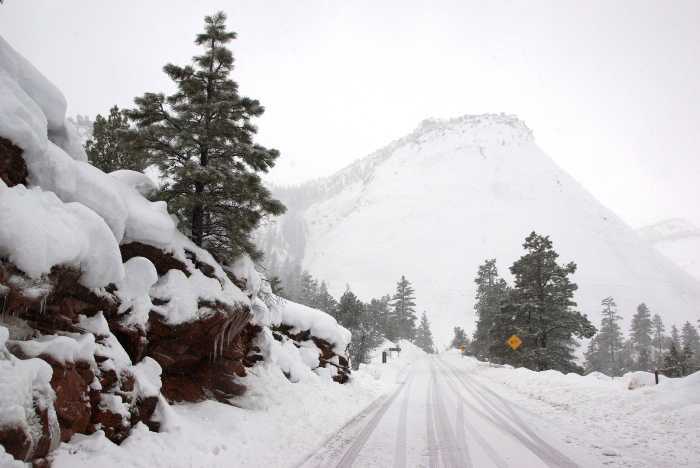 Here’s a look at the drive into Zion National Park on a snowy day. 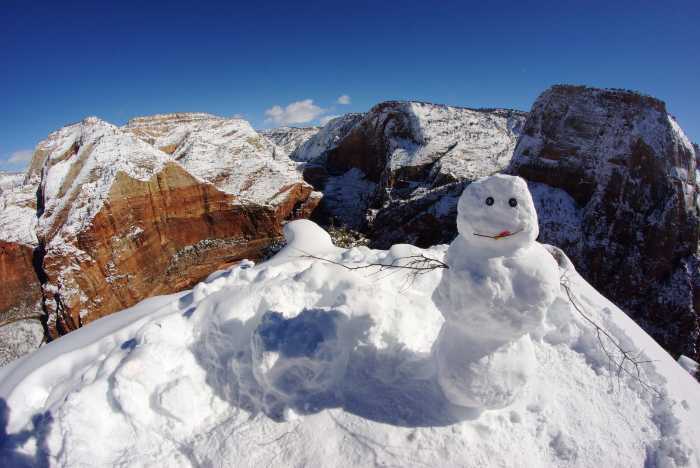 If you’re not afraid of the cold, you’ll have a blast in the snow at Zion National Park. Pack a few layers, brush up on your winter driving skills, and get ready to go on some amazing snowy hikes!